We’re coming down the home stretch now as fantasy leagues are in their last 30% of the regular season. It is still vital that you keep your ‘eye on the prize’, and one way to do that is to continue to pick up valuable waiver-wire pieces that are widely available. And that’s what you will always find here at Fantasy Furnace! 1. Justin Ruggiano-OF-Marlins- Here for starters is one of the hottest hitters in the league over the last two weeks and he is available in 75% of leagues. If you’re wondering what to do now that Giancarlo Staton has succumbed to right knee surgery (he’ll be on the DL for 4-6 weeks), take a look at Rugiano. Through 90 AB’s in a limited role, he has collected 6 HR, 17 RBI, and scored 15 runs to go along with outstanding batting percentages: .378 BA-.722 SLG- and 1.169 OPS. He also stole 3 of his 6 bases last Friday vs the Nats! Ranked 9th in Yahoo! leagues over the past 14 days, Ruggiano is a ‘Must Add’ in mixed leagues. 2. Michael Brantley-OF-Indians- Almost as explosive as Ruggiano, Brantley the 25 year old undrafted outfielder is ranked 10th in Yahoo! leagues overall over the past 14 days. 2012 is slowly shaping up to be Brantley’s breakout season. He currently in on a modest 13 game hitting streak with 7 multi-hit games during that stretch. He won’t bring much power to your team (he has 4 HR all season), but his .302 BA , 27 doubles, and 10 SB will come in handy for some owners out there. He is only owned in 33% of leagues. 3. 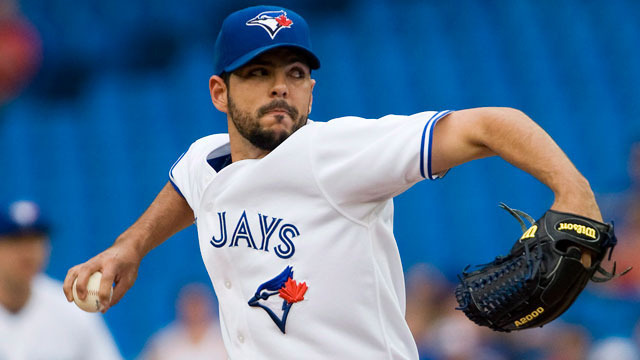 Carlos Villanueva ,RP-Blue Jays-Given all the Blue Jays injuries to their rotation, Villanueva has been a breath of fresh air as he currently owns the starting five’s best ERA , .268. Since joining the rotation he has started three games, going 2-0 with a miniscule 1.59 ERA, 21 K’s and just 6 BB’s. He is a must add in mixed leagues and can even be garnered by you streamers out there. (He faces the Boston Red Sox on Saturday). Owned in only 10% of leagues, we recommend that you take a flier out on him. 4. Dayan Viciedo-OF-White Sox- We were surprised to see that this 23 year old undrafted power hitter is only owned in 29% of leagues. Playing in his first full season with the White Sox, manager Robin Ventura gets some of the credit for the youngster’s success as he was responsible for keeping him inserted on the lineup card even when he was struggling earlier in the season. Over the past 14 days, Viciedo is batting .324 (11-34). Very quietly he is on pace to finish the season with 28 HR’s-75 RBI’s and 80 Runs scored. 5. 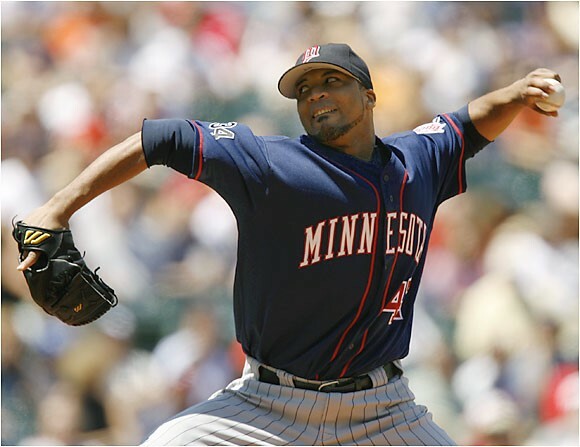 Francisco Liriano-SP,RP-Twins- This veteran southpaw has clearly had his ups and downs over his career since originally being signed by the S.F. Giants in 2000. As it appears that he will be traded to the Angels prior to the July 31st deadline, his value automatically rises. As you have probably heard by now, Liriano had one of his best games of the season last Friday vs the Athletics when he struck out 15 in a 6-3 losing effort. The 15 K’s are the 2nd most in Twins history since Johan Santana’s 17 K’s in August of 2007. Over Liriano’s last 9 games, 6 were ‘quality starts’ as he lowered his already high ERA down from 7.20 to 4.93. He had 5 or more K’s in every game and 8 or more in three of them. The 28 year old has been gearing it up in anticipation of his ‘probable trade. Owned in 44% of leagues, he’s a good speculative mixed league pickup and graded “A” for streamers.